Slip and Fall Injuries • Trip and Fall | Brunswick Georgia Personal Injury Lawyers – The Dow Firm, P.C. In the state of Georgia, owners, occupiers and landlords of land and premises have an affirmative obligation (in varying degrees) to make their property safe for visitors and residents. And there are various overlapping laws that regulate the safety of these premises. The touchstone law in Georgia which imposes a legal obligation regarding premises is O.C.G.A. § 51-3-1 which states, “Where an owner or occupier of land, by express or implied invitation, induces or leads others to come upon his premises for any lawful purpose, he is liable in damages to such persons for injuries caused by his failure to exercise ordinary care in keeping the premises and approaches safe.” Generally speaking, this means that places of business and residences must be safe for people who enter upon their grounds. The law in Georgia governing premises safety is not, however, just confined to the statute referenced above. For instance, O.C.G.A. § 30-30-1 et. seq. requires that businesses comply with ADAAG (Americans with Disabilities Act Accessibility Guidelines) and ANSI (American National Standards Institute) standards which are incorporated in the Rules and Regulations of the Georgia Safety Fire Commissioner. Likewise, architectural guidelines such as the International Building Code and the Life Safety Code impose duties upon owners and occupiers of premises (and the people who design the premises). The most important issue in such cases is the premises’ owner/occupier’s superior knowledge of the hazard that causes the harm to the victim on the premises. Claims in Georgia related to a slip and fall, trip and fall and other premises-related injuries and deaths come in a variety of forms – from temporary conditions (like a grape in the aisle of a grocery store) to “static” defects and conditions (such as architectural building errors) that are more permanent in nature. Liability can stem from such things as an owner/occupier’s negligent design, construction, maintenance, repair and/or inspection of the premises. 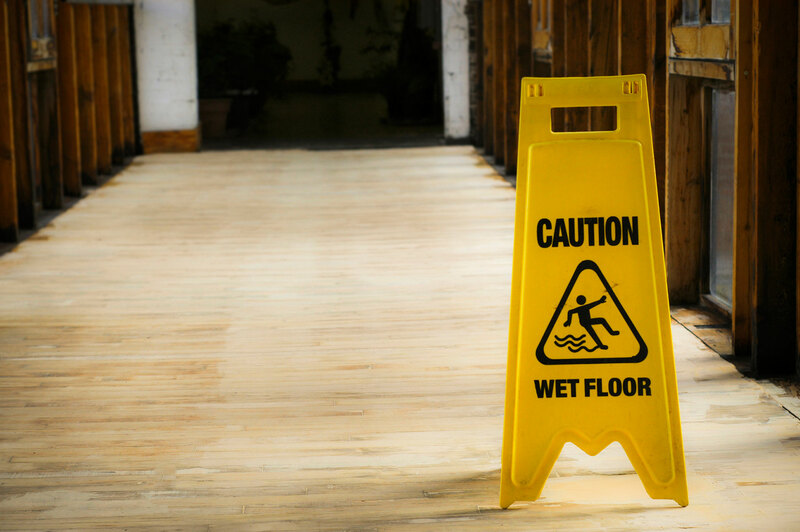 Common hazards include slippery floors or obstacle-laden floors (caused by spills, misplaced objects, etc. ), dangerous stairs/steps, non-compliant “safety” devices such as handrails, guardrails, ramps and fire alarms, improperly serviced elevators and elevator shafts, unmarked curbs, bunched or sticky carpet, hazardously constructed decks, incorrectly installed playground equipment, unsecured/unfenced swimming pools, poor/inadequate lighting, insufficient drainage and no warning signs. Slip and fall injuries can occur in hotels, motels, parks, jails (such as a bunk bed injury from falling in a cell), colleges and most other businesses. Often in cases involving premises-related injuries/deaths, the conditions which caused the harm will be addressed by the premises owner/occupier shortly after the incident. For that reason, it is essential that counsel be retained quickly so that a prompt and thorough inspection of the premises can be accomplished to insure valuable evidence is not lost or compromised. The Dow Firm, P.C. has an established record of success in gathering and presenting the evidence necessary to secure favorable outcomes in premises cases. The Dow Firm, P.C. is proud to offer services and represent clients with slip and fall / trip and fall accidents and related claims in Glynn County (Brunswick, Country Club Estate, Dock Junction, Everitt, Jekyll Island, Sea Island, Sterling, St. Simons Island and Thalman), Brantley County (Atkinson, Hickox, Hoboken, Hortense, Lulaton, Nahunta, Trudie and Waynesville), Camden County (Colesburg, Dover Bluff, Harrietts Bluff, Kings Bay Base, Kingsland, St. Marys, Tarboro, Waverly, White Oak and Woodbine), Wayne County (Jesup, Odum and Screven), McIntosh County (Cox, Crescent, Darien, Eulonia, Pine Harbour, Ridgeville, Shellman Bluff, South Newport, Townsend and Valona), Pierce County (Blackshear, Bristol, Mershon, Offerman and Patterson), Chatham County (Bloomingdale, Garden City, Georgetown, Isle of Hope-Dutch Island, Montgomery, Port Wentworth, Pooler, Savannah, Skidaway Island, Thunderbolt, Tybee Island, Whitmarsh Island, Wilmington Island and Vernonburg) and counties throughout the state of Georgia. The Dow Firm, P.C. is located in Brunswick, GA, however, our firm is able to manage slip and fall and all types of personal injury cases anywhere in Georgia.